When large fillings need to be replaced, stronger and more precisely shaped restorations are required. These are known as inlays or onlays. Inlays are placed inside the tooth, and onlays are placed on the tooth’s outer surface. Inlays and onlays are made of porcelain at an off-site dental laboratory. Once our dental office receives the custom inlay or onlay, the restorations will be bonded into place. 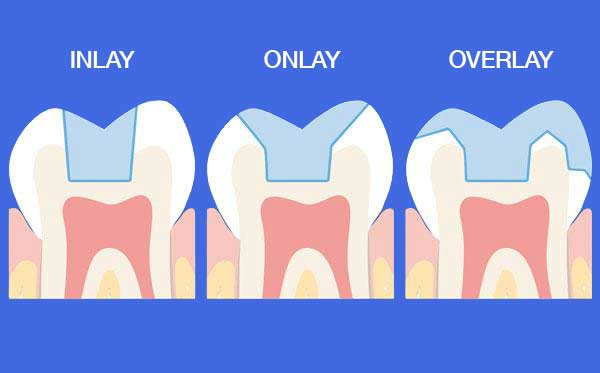 Onlays are similar to crowns but conserve more of the natural tooth structure. With proper care, onlays should provide a lifetime of service. Our dental experts at Westside Center for Periodontics and Implant dentistry has brought back the beauty and function to the teeth of thousands of patients through custom inlays and onlays. Like crowns, inlays and onlays treatments require two appointments. They are made of porcelain and fabricated at an off-site dental lab. Once our office has the inlay or onlay, they are bonded to the damaged area of the tooth. The procedures for inlays and onlays are very similar. During the first appointment, the dentist begins by numbing the area with a local anesthetic. Any decay or damage found is removed by drilling, which at the same time cleans and prepares the tooth. Once the area has been cleaned and prepared, an impression of the damaged tooth is made with dental putty. The impression is then sent off to a dental laboratory, where the inlay or onlay will be made from porcelain. Your inlay or onlay will not only fit your tooth exactly but will also match the normal color of your tooth. While these are being fabricated, your dentist will create a temporary cover or filling to protect it until the inlays or onlays are finished. During your second appointment, the dentist will remove the temporary cover, and ensure that the inlay or onlay fits correctly. Once the inlay or onlay fits perfectly, the dentist will bond it to the tooth with a strong resin adhesive. The treatment is completed after the inlay or onlay is polished to ensure a smooth and natural looking finish. Each appointment for an inlay or onlay treatment only takes about an hour. The first appointment might take slightly longer because the dentist will have to prepare the area for the procedure. There might be some discomfort after the inlay or onlay procedure, and the new surface may feel a little strange. But you will soon get used to how it looks and feels. There might be some soreness in the tissue around the treated tooth, but the soreness should go away in a couple of days. However, if you do feel some discomfort, taking over-the-counter pain medicine should help with the symptoms.